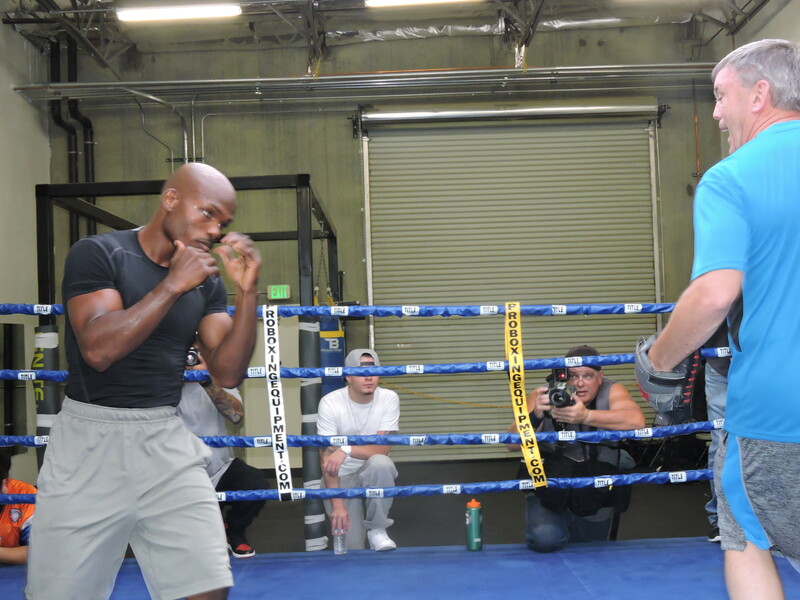 Timothy Bradley works with trainer Teddy Atlas during his media workout on Oct. 28 in preparation for his fight against Brandon Rios. Bradley will face Rios on Nov. 7 at the Thomas and Mack arena in Las Vegas. A day earlier, Brandon Rios said he was expecting to see the same Timothy Bradley that dominated future Hall of Fame boxer Juan Manuel Marquez two years earlier. On Oct. 28, Bradley said he’s expecting Rios to be at his best as well, feeling he will see the same level Rios demonstrated his first fight against Mike Alvarado in a battle that was voted the Fight of the Year in 2012. There is good reason to expect Bradley to be at his best. When Bradley beat Marquez, it was at the Thomas and Mack Arena in Las Vegas. Bradley will face Rios on Nov. 7 in his return trip to the basketball arena on the UNLV campus. “I beat a Hall of Fame fighter, so it makes me world-class,” Bradley said. “I beat a household name. However, Bradley returns to Thomas and Mack with two distinct differences. Since his 2013 victory over Marquez, Bradley has since replaced manager Cameron Dunkin, and most recently, trainer Joel Diaz. Bradley’s wife Monica took over manager duties right after the Marquez fight. Diaz, who had trained Bradley since he turned pro in 2004, has been replaced by renown and respected trainer Teddy Atlas. “In general, sometimes we get … content doing the same thing over and over. If it ain’t broke, don’t fix it,” Bradley said. “As I saw my career going forward, I saw it going south, getting hit with big shots, not doing the right things in the ring. While some things have changed, Bradley said fighting inside Thomas and Mack will be comforting. “I like that arena, it’s nice and compact, there’s not a bad seat in the house,” Bradley said. “It was one of my best performances I ever had in Vegas. I’m looking forward to it.